KHARKIV, Ukraine -- Beside an overpass 8 kilometers (5 miles) from the center of Kharkiv lies a newly dug network of trenches lined with bark so fresh the sap still oozes out. 30 km (19 mi) from Russia and just outside Kharkiv city are these fortifications against incursion. Local activists skeptical. 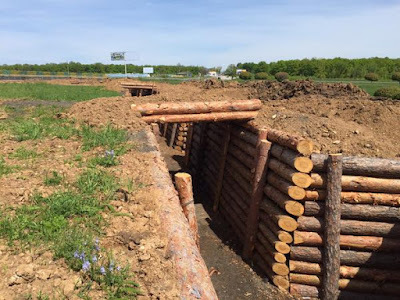 Regional Governor Ihor Raynin told RFE/RL of state-of-the-art fortifications being built here to guard against an invasion from Russia, 30 kilometers up the road, and in the south to ward off any advance by Moscow-backed separatists from the Donetsk and Luhansk provinces. But Oleksandr Zalyvan, a military adviser who once served with NATO peacekeeping forces in Bosnia, is not impressed. He would never agree to be deployed in the trenches, he says -- Russian tanks would destroy them and everyone nearby in an hour. "It's public relations," Zalyvan says. More than a year after pro-Russian activists stormed Kharkiv's regional administration building and tried to proclaim a separatist republic, symbols of Kiev's control blanket Ukraine's second-largest city. Blue-and-yellow national flags line the main thoroughfare under the towering glare of iconic Ukrainian poet Taras Shevchenko, whose monument has itself been fitted with a blue-and-yellow scarf. About 200 meters (656 feet) from the administration building, at the site of last year's pro-Russian protests, sits the stump of what was once a statue of Bolshevik Revolution leader Vladimir Lenin. Without waiting for a law banning communist symbols, which President Petro Poroshenko signed last month, pro-Ukrainian activists dragged Lenin down in September. But the outward symbols of Ukrainian identity and strength do little to hide the tensions that could weaken Kiev's grip -- from dismay over economic hardship to fears sparked by a spate of bombings that have underscored the threat of the conflict in Donetsk and Luhansk reaching Kharkiv. "Because of its location, because of its history, because of its ties with Russia, it seems like the government is just trying to make much more of an effort to show that [Kharkiv] is within its orbit," said Eugene Chausovsky, an analyst at U.S.-based think tank Stratfor. "But talking with the people gives you a different impression." The deterioration of Ukraine's relationship with Russia, which has provided military backing to the separatists in a conflict that has killed more than 6,300 people since April 2014, has hit Kharkiv hard. Turboatom, the region's largest factory, had long relied on exports of its turbines to Russia, but the sprawling plant on Kharkiv's Moscow Avenue has seen massive cutbacks over the past year. And workers at Elektrovazhmash, a major heavy machinery plant, complained to local media about decreasing capacity because of the army's mobilization efforts. "I had 420 people, now I have 380," said Serhiy Svichuk, a manager at the plant. "That creates a serious problem." Mayor Hennadiy Kernes, who is among the last of the former members of deposed President Viktor Yanukovych's pro-Russian Party of Regions to continue to wield significant power following Ukraine's Euromaidan revolution last year, says city industry relies on Russia. "The destination of trade from Kharkiv industrial facilities and the machine-building sector is for the most part the Russian Federation -- the customers and the buyers [are there],” says Kernes, who is facing charges of kidnapping and torture during Euromaidan protests last year. "From that, of course, comes financing for salaries" and for "renewal and repair projects, construction projects. All of those things are mutually dependent." Since the conflict with the separatists began, Ukraine's economy has contracted by almost one-fifth and inflation has risen by as much as 60 percent. In a March survey by the Washington-based International Republican Institute (IRI), the Kharkiv region ranked second to last in support both for Poroshenko (27 percent) and for the national parliament (18 percent). Few in Kharkiv express the desire to go the way of the self-proclaimed "people's republics" of Donetsk and Luhansk, but many blame Kiev for their problems. "It's the fault of the new authorities, not the nation itself," says Georgiy Nachkebiya, 23, an unemployed Kharkiv resident who is originally from Donetsk and says he feels a connection to both Russia and Ukraine. "I want Ukraine to stay Ukraine," says Nachkebiya, an ethnic Georgian who sees himself as "more patriotic than lots of Ukrainians." Amid these tensions, Kharkiv has also weathered a series of bomb blasts that have appeared to target pro-Ukraine activists. In the most serious, on February 22, four people were killed when a bomb exploded in the middle of a Peace March of pro-Kiev demonstrators. These acts, say Kiev supporters, demonstrate the importance of showing Ukrainian might in whatever way possible. Raynin, who was appointed governor by Poroshenko in February, says that doing so goes beyond symbolic gestures. "If we couldn't defend this city, there would already be a self-proclaimed republic here," he says. Still, he says image-making is part of the battle to ensure Kharkiv remains under Ukrainian control. "Today's problems, which unfortunately are the same problems of the past 24 years of independent Ukraine, are that no one worked with the people, or properly conducted the propaganda of patriotism," he says. But the complexity of the task was displayed in stark form on May 9 as the city celebrated Victory Day, marking the 70th anniversary of Nazi Germany's World War II defeat. Mindful of Russian President Vladimir Putin's use of the holiday to flaunt the Kremlin's military might and hammer home its narrative of the war, Ukrainian authorities sought to rebrand it this year, calling for commemorators and veterans to wear red poppies rather than the black-and-orange St. George ribbon that has become a symbol of the pro-Russian separatists. As hundreds filed past Kharkiv's Memorial to the Heroes in a rainbow of Soviet and Ukrainian flags, some in the crowd began to chant Soviet victory slogans.